Our pool safety net is a unique swimming pool safety solution. Made from ultra-durable netting, it lets you see the scenic water of your backyard oasis, while protecting small children, loved ones living with disabilities, and pets from entering the water. The openings in the pool safety net are small enough to keep the head and body of a toddler from slipping through, and large enough to prevent a toddler from using the net as a play surface. At A Safe Pool, supplying pool safety barriers that protect small children, adult loved ones living with disabilities, and even pets is our number one concern. We are also committed to making pool safety affordable, providing durable products at prices that are always exceeded by the value in safety. 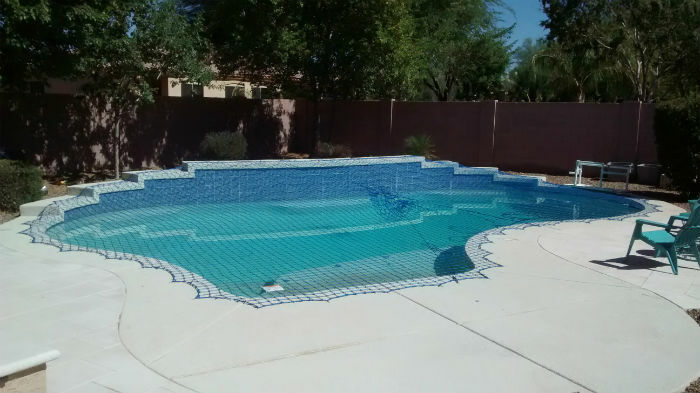 To schedule a free estimate of your pool site for our pool net cover in Phoenix or elsewhere, please contact us today.